In the run-up to the Lok Sabha elections that kick off on Thursday, English news channel Times Now has launched its ‘Swachh Neta: Mission for Clean Politics’ initiative to educate and empower the citizens to make an informed voting decision. Led by insights from the common voting behaviour patterns of Indian voters, which is largely driven by inadequate information about electoral contestants, ‘Swachh Neta’, a voter welfare initiative, urges all Indian voters to do a thorough background check of the candidates prior to voting. In a recent All-India Survey 2018 released by the Association for Democratic Reforms (ADR), an important factor emerged: while 97.86% Indian voters do not want candidates with criminal antecedents in Parliament and the State Assemblies, 36.67% don’t know about the criminal records of candidates contesting elections. Swachh Neta aims to bridge this indifferent and detached approach to embrace a clean political ecosystem by driving the importance of involvement, scrutiny and background check in making the right voting decision. 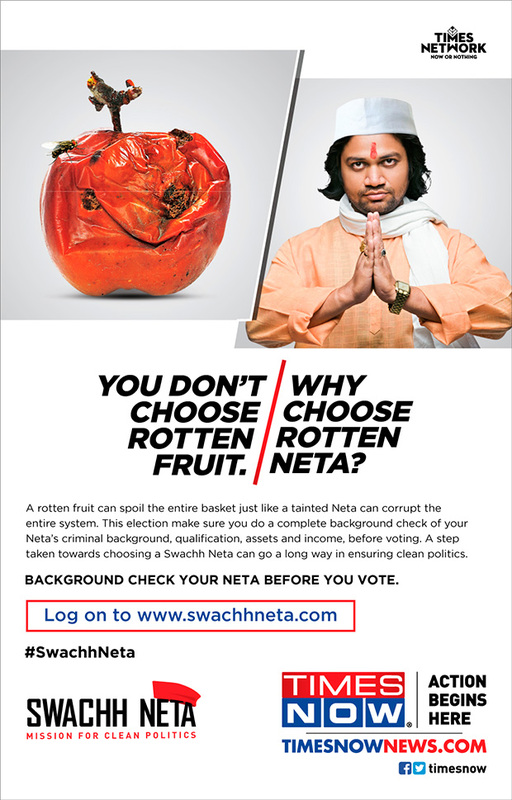 Times Now has launched www.swachhneta.com in partnership with ADR, facilitating a background check of candidates in various constituencies on parameters such as qualification, criminal record, financial income and assets. The aggressive marketing campaign on the Swachh Neta initiative includes: Digital: Video promotion, display banners, content marketing, social media promotion across the network’s digital assets and leading digital/social platforms. Print: Print ads and innovations across The Times Group dailies. TVCs: The three TVCs highlight real-life analogies to establish the paradox of involvement in decision-making for simple things versus voting for their electoral candidates. The narrative of TVCs reflects upon the importance of an informed voting behaviour and urges voters to do a background check on their Neta. The 60-second TVCs will be played out on all Times Network channels.